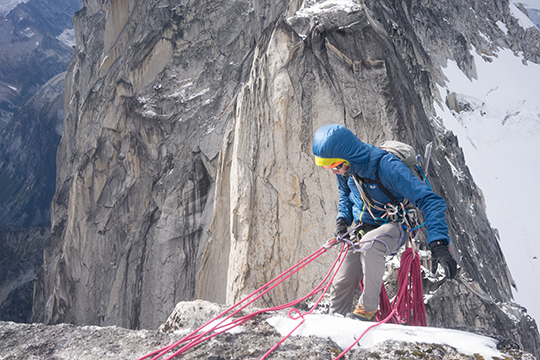 When you climb in cold places, you quickly learn the value of a lightweight puffy jacket. The promise of a sunny morning can dissolve quickly in the alpine: the wall passes into shadow, belays get long and cold, and the wind picks up. An insulated parka can make the difference between starting the next pitch excited or shivering. There's a broad range of belay coats available today, and each sport and environment demands different features. Down offers unsurpassed warmth-to-weight ratio, but the wet climate of the Pacific Northwest can render the feathers into useless lumps. I tested the Xenon synthetic puffy jacket, made by Rab, for both alpine rock climbing in the Wind River Range and summer mountaineering in the Coast Range of British Columbia. First, I tested the Xenon on Lost Temple Spire in the Wind River Range. During the climb, it remained out of the way, stuffed into its own pocket and clipped to my harness. As the afternoon progressed, our route spiraled onto the steep north face. As the wind picked up and the temperature dropped, I pulled on the jacket and kept it on when it was my turn to lead the next long crack pitch. I warmed up from the physical climbing and opened the zipper to release sweat. I was grateful for the tight weave and snug hood—which sat loosely on my bare head but tight around a helmet. The Xenon hoody combines the insulation of a light puffy with a windbreaker but doesn't breathe as well as other jackets like Patagonia's Nano Air hoody. The Xenon's warmth comes from Primaloft Gold, regarded as the industry standard in synthetic insulation for its warmth-to-weight ratio. This insulation is wrapped in tightly woven Pertex Quantum fabric, which is optimized for wind protection. This is why the Xenon doesn't breathe as well as jackets designed for active insulation, but it is more wind resistant, almost like wearing a windbreaker on top of a puffy in one sleek coat. The jacket's combination of warmth and wind resistance is perfect for climbing on shady walls. I wore the Xenon on the Beckey-Chouinard (IV 5.10, 2,000') in the Bugaboos. While climbing, clouds blocked the sun and the temperature dropped toward freezing. I appreciated it's insulation and climbing-specific design as I climbed the upper half of the route. The hood didn't blow off in wind; the elastic wrist cuffs kept drafts out; and the Xenon's stretchy waist sat above my harness gear loops, keeping it clear of cams and quickdraws. The Xenon is a useful size and weight for alpine rock climbing. It weighs 14 ounces, which is about the median for synthetic jackets designed for static warmth. It's 2.6 ounces lighter than the Arc'teryx Atom AR and similarly heavier than the ultralight Montbell UL Thermawrap jacket. The jacket stuffs into its pocket to form a sack about seven inches long. While climbing last summer in Canada's Waddington Range, this jacket served as a mid-weight layer that I could wear for afternoon belays and while climbing on cold mornings. We climbed through intermittent rain, and while the DWR coating did little to keep the jacket from absorbing water, the synthetic insulation stayed warm. Overall the Xenon is just what I want for an insulation layer on chilly rock climbs. When the temperature hovers in the low 50s and 40s, I can wear it to belay and don't need an additional windbreaker because of its tight weave. When it's time to climb, I can quickly stuff it into its pocket and clip it out of the way on my harness. If the temps drop further, I can leave it on while climbing and the slim design keeps the jacket from blocking access to my harness or impairing movement. There are more breathable and warmer parkas, but this one strikes a balance between these qualities and it's highly compressible, which is a big plus when moving quickly in the mountains.